When introducing the Frankfurter Crown Roast I mentioned that there is a distinctively German way to mistreat sausages. It is called Würstchengulasch (sausage stew). And I don’t mean an atrocity of the distant past here, we’re talking German home cooking 2013 style. When making proper goulash (or pörkölt to be more ecxact), you automatically get a delicious sauce from paprika, meat juices and onions. But his takes time. Wieners have the incredible advantge that they are already cooked. They just don’t make a good sauce when cooked. In fact they don’t make any. 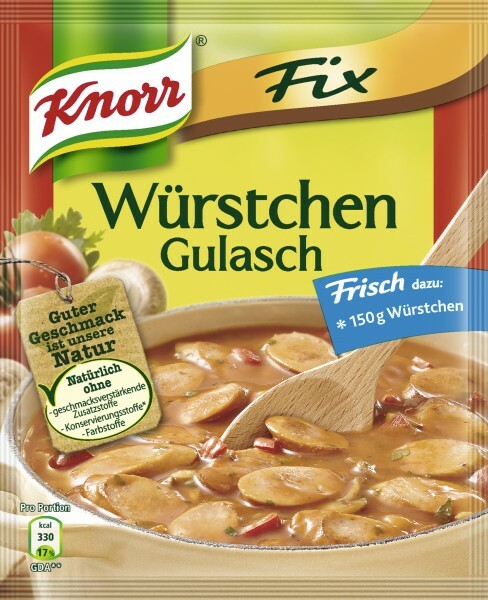 So the talented food chemists at Knorr (and of course also Maggi) whipped up a “Fix”. Chop the sausages, add water and a bag of Fix, cook for five minutes, and a you can enjoy your bowl of horse puke.